Disclosure: This post contains Savings.com affiliate links. 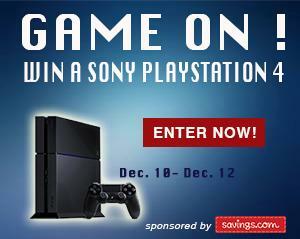 Savings.com is giving away a Sony PlayStation 4 to TWO lucky winners! This giveaway runs through Friday, December 12, 2014, at 11:59 p.m. EST. Two winners will receive a Sony PlayStation 4 valued at $399.99. Enter the giveaway by going to the Sony page on Savings.com and submitting your email address. Winners will be notified by Tuesday, December 16. Click here to enter. Good luck! Also, while I am on the subject of Sony, have you seen this awesome deal? Get 23% off a 40″ Sony Smart LED HDTV. Now that’s what I call a good deal! 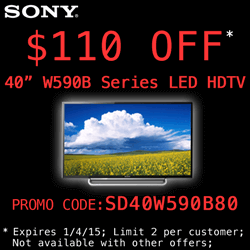 The 40″ Sony Smart LED HDTV was originally $479.99, and is now $369.99. Use PROMO CODE: SD40W590B80 There are limited quantities so order now. There is a limit to 2 per customer. Offer expires 1/4/2015. Click here to order.